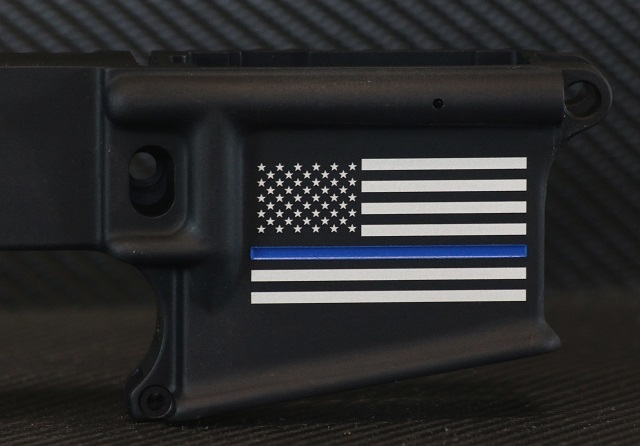 Show your pride and support for the law enforcement community with The Thin Blue Line Flag engraved AR15 lower receiver. 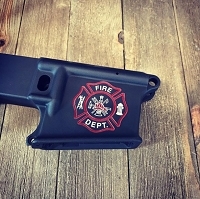 We use an industrial laser with extreme precision to turn your standard run of the mill lower receiver into to a masterpiece, and a great tribute to the law enforcement community that risks their life daily for our safety. The blue line is deep engraved then color filled with high quality paint in a proprietary precision process that looks fantastic and is sure to turn heads. Should you desire personalization such as a badge number, name or text we can accommodate most requests. Our standard lower receiver is the Anderson Manufacturing AM-15 Multi Cal marked lower receiver. Forged from 7075-T6 aluminum and hard anodized to mil-spec type 3 requirements. These lowers are known throughout the industry for their reliability and affordability. These are great quality lowers that are easy on the budget. We also offer the ability to upgrade to a more “tacticool” Spike’s Tactical Lower. These receivers are excellent quality and are finished off with a very durable layer of anodizing. These have a great reputation for being one of the best forged lowers available, with almost a cult following. Anodized to exceed mil-spec standards and forged out of 7075-T6 aluminum, and featuring a wide variety of logos and variants, there is one for everyone. All new lowers we provide must be shipped to an FFL holder in your state for applicable background check. If you are sending us a lower currently in your possession for work, we can mail it directly back to you. Please insure your shipment and ship with a signature required and a copy of your driver’s license included. Great stripped lower receiver. Etching and white/blue flag looks and feels great. Happy with this purchase and I’m looking forward to this build. Awesome lower! Engraving was better than I expected. Great communication. Lower was for a very special build after a very long career. They did not let me down. Buy with confidence! Custom Engraved AR15 Lower Receiver - Premium engraving with your text or graphics! Custom Engraved 80-Percent AR15 Lower Receiver - Premium engraving with your text or graphics!